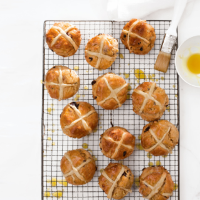 Quicker to make than a yeasted hot cross bun but with all of the fruit and spice, these are just the thing for Easter tea. 1. Preheat the oven to 220°C, gas mark 7 and heat a baking sheet in the top third of the oven. Sift the flour and baking powder into a large bowl with ½ tsp salt. Rub in the butter until the mix looks like fine breadcrumbs, then stir in the spice, sugar, apples, dried fruit and orange zest. 2. Warm the milk to room temperature then stir in the orange juice and vanilla plus 2 tbsp beaten egg. Combine this mixture with the dry ingredients to make a rough, sticky dough — stirring quickly with a round-bladed knife as you pour will keep the scones light. 3. Flour a clean work surface, tip the dough onto it then flour the dough and your hands. Gently knead a few times until a little smoother, then pat into a round about 3cm thick. Dust with more flour, then stamp out 6cm rounds using a straight-sided cutter. Pat together the leftovers and repeat to make 16 scones. 4. To make the crosses, stir 6–7 tbsp cold water into the plain flour to make a smooth paste. This will loosen as it sits, so don’t be tempted to add too much water. Spoon into a food bag or disposable piping bag and snip off the end at about 5mm. 5. Sprinkle the hot baking sheet with flour, then add the scones. Pipe crosses over the tops (see Cook's Tip below) then bake for 12 minutes or until risen, golden and they sound hollow when tapped underneath. Stir 1 tsp boiling water into the golden syrup to make a glaze, then brush over the scones and leave to cool on a wire rack. COOK'S TIPThe quickest way to get all of the scones piped with crosses is to line them up on the baking tray, pipe down then across all the rows. If any of the paste stays joined up between some of the scones, just snip it with kitchen scissors. This recipe was first published in Tue Mar 01 15:56:00 GMT 2016.